SPECIALIST careers events jointly hosted by League Football Education and The Dame Kelly Holmes Legacy Trust were successfully brought to life by ICG's design and digital teams.Elite young athletes seeking their next rung on the career ladder attended the exhibition, workshop and mentoring conference called Create Your Legacy held in both Manchester and Reading.Designed to help young sports men and women 'create their own legacy' by planning for new careers in sport, education and business, delegates also got the chance to hear from Kelly Holmes herself.Create Your Legacy branding was rolled out online, on social media and on exhibition material including the event guide and pop-up stands. 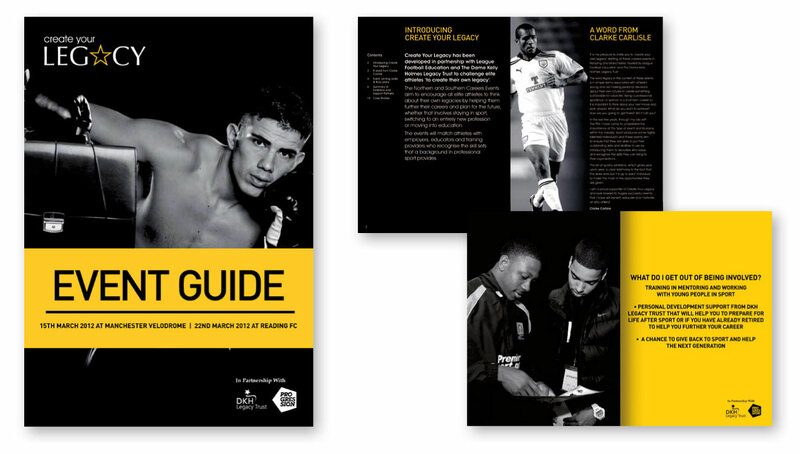 Iconic black and white photography was used alongside a dynamic black and yellow colour palette. A digital presentation was also produced to help delegates get the most out of the help and advice available.ICG has worked extensively for League Football Education which has hosted the event for the second year running under its Progression brand.